More lethargic than he had been last night. 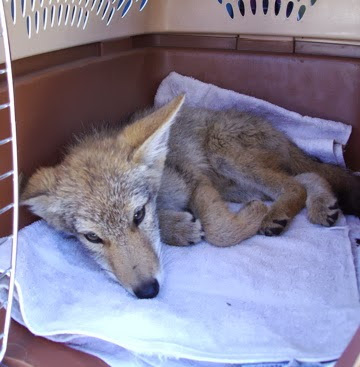 This coyote pup, found weak and dehydrated by a road somewhere in the area yesterday, came into the local rehabilitation center last evening. M. and I paid him a brief visit after dropping off yet another fawn, this one supposedly found in the East Peak FIre zone near Walsenburg. He had been pumped up with Ringer's solution and had taken some food and water orally, but he was still quite wobbly. Our local rehabbers do ungulates, bears, and cats, but not coyotes. They made arrangements this morning to transfer up him to someone else up north who does have coyotes. Since we were coming to Colorado Springs anyway, we agreed to drive him up and hand him off. The second rehabilitator was not too optimistic when she saw him. He was lethargic and dehydrated again. The possibility of distemper had already been discussed. The vet will see him soon, and if it's distemper, that means the needle. Not every animal survives. EVENING UPDATE: It did have distemper, which meant the end of the trail.